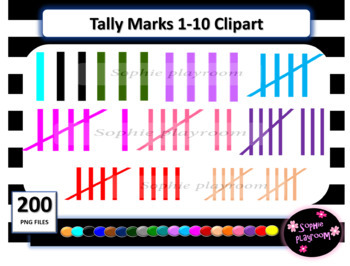 200 .PNG Tally Marks clip art images in 20 different colors for personal and commercial use. You will receive Tally Marks 1-10 shown on the preview in all the colors shown above and more! Clip Art products: For educational use; all products must be secured in a pdf file or flattened. Commercial Use: You can use the images in products for sale or freebies on TpT site with a link to sophieplayroom or my logo, which is included in your download. This product is a collection of individual .PNG images contained in a .ZIP file. Please ensure you extract/unzip the file to use it. If you have issues please contact TPT’s technical assistance.